This was taken about 17 years after she started service for BC Ferries as the "Sidney" in 1960. She is seen here in the original BC Ferry 'pastel blue' livery which was the standard between 1960 & 1985. 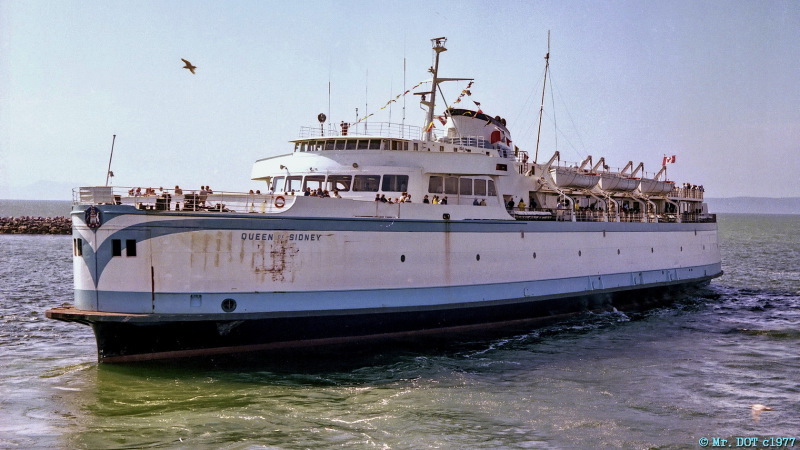 She stared service in 1960 working BC Ferries first (and still most important route) between Swartz Bay on Vancouver Island near Victoria, and Tsawwassen, on the mainland. She was replaced on that route after just a few years by larger vessels. For the balance of her years with BC Ferries she was assigned to smaller runs serving the Gulf Islands and she worked as a refit relief vessel. Her last assignment with BC Ferries was on the northern Georgia Strait crossing between Comox on Vancouver Island and Powell River on the mainland. She was decommissioned in the year 2000. Nice shot of an old workhorse. I will soon be calling Victoria home. much more dignity in this active life shot than in her present discusting condition, onetime my workplace as deckhand,mrdot. Great photo, thanks for posting, Mr. DOT! Nice photo. In much better shape here than current condition (abandoned on the banks of the Fraser River).